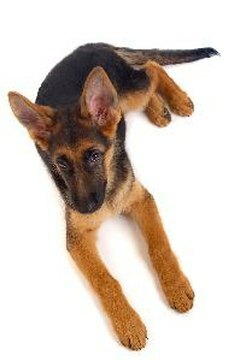 German shepherd puppies are the most likely to have carpus malformations. Your first clue that your dog has a carpus malformation could be a sudden change in the way he walks or just a sense that your dog's feet don't look right. Either way, getting a diagnosis and choosing a treatment will take some detective work on your part. Carpus bones are the bones between the toes and the wrists in all four paws. Carpus malformation may affect just one foot or all four feet. It may be genetic, nutrition-based or caused by injury; it can be a passing phase or a permanent disorder. German shepherds have the highest rate of carpus malformation, but other large-breed dogs may also suffer from it. Carpus malformation causes progressive lameness as the dog grows. It may begin with swelling, tenderness and obvious pain in the foot, or the dog's gait may change gradually or suddenly, with or without pain. Carpal Subluxation Syndrome is the most common carpus malformation in dogs, and the most controversial. No one can seem to agree on what causes CSS or on how to treat it. Different breeders and veterinarians will tell you it's genetic or caused by poor nutrition or by differential growth rates in a puppy's bone, or by injury to growing joints. Regardless of its cause, CSS always looks the same: The carpus bones drop until the whole foot, from the toes to the ankle, is on the ground when the dog walks. Allowing the dog to stay "down in the pasterns" (another name for CSS) causes further injury to the bones and joint tissues. Almost all carpus malformations in dogs are classified as CSS. But it is also possible for dogs to be born with congenital malformation, otherwise known as birth defects, of the carpal bones. Early injury of a carpus or carpal joint can also cause malformation if the bone or other tissues heal incorrectly. These malformations are more likely to affect only one foot, and surgery is likely to be the first treatment your vet recommends. Carpus malformation treatment is as controversial as its cause. Luckily, all treatments have some success, so if the diagnosis is CSS, your veterinarian will probably begin with a low-protein, low-calcium, low-phosphorus diet combined with certain vitamin and mineral supplements. Some veterinarians will have your dog work with a physical therapist to exercise and strengthen the affected feet. Many puppies grow out of CSS with this treatment. If this doesn't work, your vet may perform surgery to stabilize the joints with plates or pins. Grunfield German Shepherds: Carpal Subluxation and Weak Pasterns - Two Different Conditions? What Can I Use to Stop Cats From Urinating on an Outdoor Shed?